Stephen Williams was born between 8 November 1639 and 1640 at Roxbury, Suffolk, Massachusetts, USA. 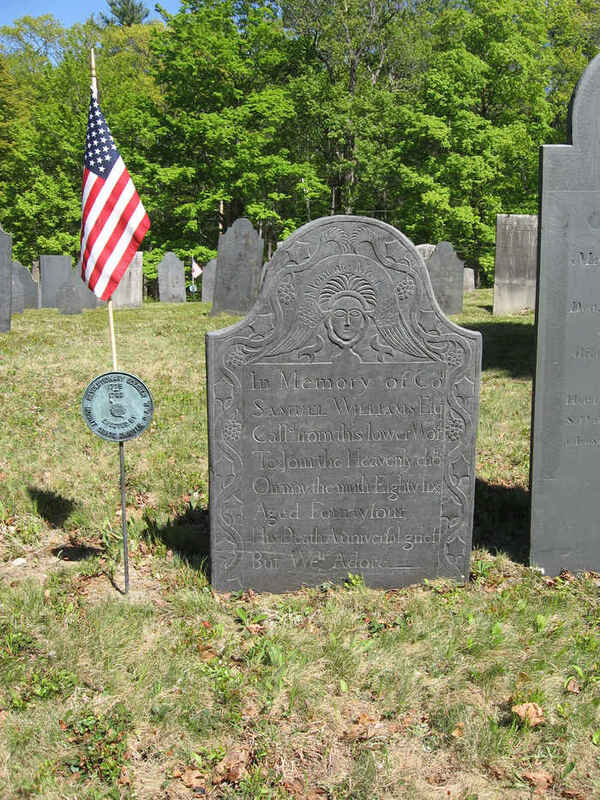 He died on 15 February 1719 at Roxbury, Suffolk, Massachusetts, USA. Alex Williamson married Mary Hunter, daughter of Jim Hunter and Margaret Gilmore, in 1879 at Pennsylvania, USA.1 Alex Williamson died in 1935. He was buried at Pennsylvania, USA. Margaret Williamson was born in 1886. She See notes for Mary Hunter Williamson. Margaret died at age 24 years. She died on 20 February 1910. She was buried at Pennsylvania, USA. Robert Bruce Williamson was born in 1890. He See notes for Mary Hunter Williamson. Robert died at age 50. He died on 12 September 1940. He was buried at Pennsylvania, USA. Ida Matilda Wilson was born in 1865.1 She married Alonzo Denbow, son of George Washington Denbow and Jane Rucker, in 1885.1 Her married name was Denbow. Willie Wilson was born on 29 September 1892 at Ardmore, Limestone, Alabama, USA. She died on 1 January 1979 at age 86. She was buried at Pensacola, Escambia, Florida, USA. Herb Winland was born in 1880 at Ohio, USA.1 He married Emma Denbow, daughter of Hamilton Denbow and Ellen Thompson, in 1925. Andrew Winnegar married Catherine Dunkelberger, daughter of Clement Dunkelberger and Anna Maria Hauer, in 1760. Esther Wise was born between 1886 and 1914 at Neffs, Belmont, Ohio, USA. Golda Wise was born in 1908 at Ohio, USA.1 She married Lawrence Conkling in 1928 at Ohio, USA. Golda Wise married Don Porter in 1930. Her married name was Conkling. Her married name was Porter. Luna Wise was born between 1886 and 1914 at Neffs, Belmont, Ohio, USA.1 She Mary Lou says she and James Penn had two or three children who maystill be living in the Neffs area. Her married name was Penn. Margaret Wise was born on 6 April 1797 at Maryland, USA. She was also known as Margaret Hamilton. She was buried in December 1870 at Lewisville, Monroe, Ohio, USA. She died on 26 December 1870 at Monroe, Ohio, USA, at age 73.